Marrakesh was founded in the XIth century by the Almoravides dynasty. Marrakesh the red lies down the Atlas mountains and is famous for its smooth climate and its palm-grove, which inspired many poets who named it, the pearl of the south. With the saadien dynasty Marrakech reached its apogee. The Almoravides left in heritage palaces and gardens such as the famous Menara and its artificial lake, dated from the XIIth century and the Koutoubia with its minaret considered as the jewel of the hispano-mauresque architecture. 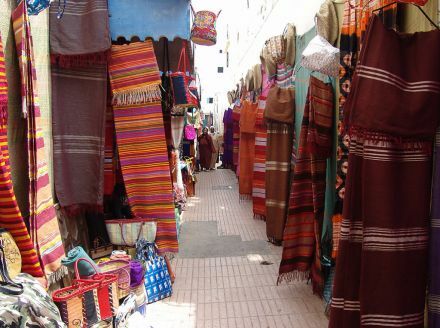 After visiting the monuments of Marrakech: the Koutoubia minaret, the Bahia Palace, The Saadians tombs and the Dar Si Said Museum, you will be dreaming for a couple of hours in the fascinating souks and narrow streets waiting for the unique sunset at jamaa El Fnaa square in the very heart of Marrakesh. There you will watch a permanent show of acrobats, storytellers, snake charmers and fire-spitters, and entertainers of every kind. Many visitors gather under the massive tents at Chez Ali, a vast fantasy village in the Marrakech palmgrove. Here, waiters and waitresses dressed in their own tribal costumes also double as entertainers. Whole roasted lamb, or mechoui, is one of the specialties, and so is a flavorful vegetable-topped couscous. Couscous, the cracked durum wheat semolina that is a staple of Moroccan cuisine, refers to the grain as well as to the finished dish. At Chez Ali a magnificent spectacle awaits you. As the evening progresses, all through the dinner, various folklore troupes pass through the tents dancing, singing and generally animating the evening. 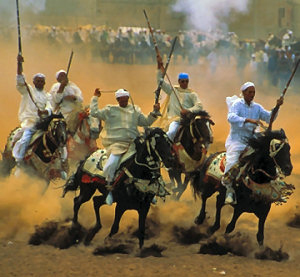 The highlight comes at the end of your meal when you are invited to witness the charging horsemen in their display of old tribal power with shouts and firing of rifles as the pull their horses to a halt. Then follows the horseback acrobatics, a belly dancer and then up in the night sky Sheherazade and her prince fly to the stars on their magic carpet, as around them fireworks explode and the evening comes to its end. At an extra charge the company name can be picked out in flaming letters or the guests can be dressed as sheiks and harem girls just to give a little extra spice to the evening. The charming small town, Essaouira (also known as Mogador) was built in 1760 by a french architect upon orders of Mohamed Ben Abdellah, alaouite sultan. 170 kms far away from Marrakech, it became the first trade harbour of Morocco in the late 18th century. Essaouira’s blue and white colored Medina was recently named a UNESCO World Heritage site. 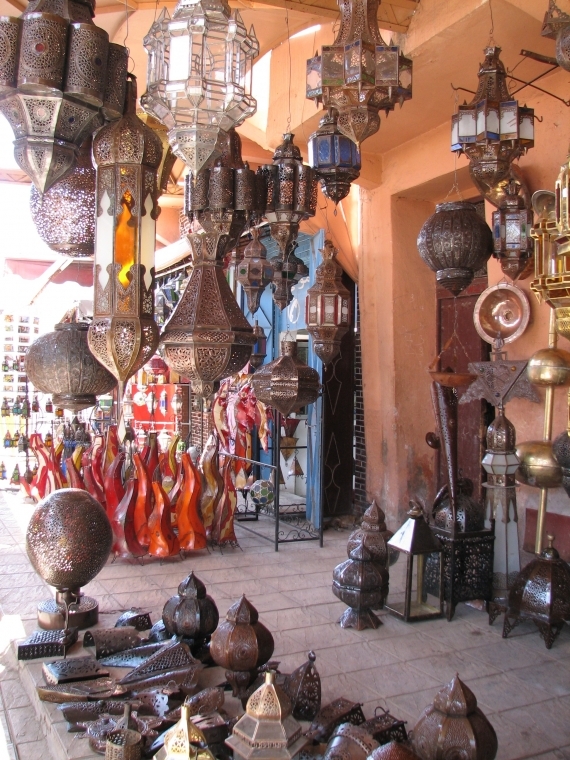 Essaouira is a handicraft centre, particularly for sandals, woodwork and silver jewellery.